This is a combined review of all of OKB Grigorov's Sherman accessory sets; or at least, all the ones I have at the moment. I'll add photos of the missing sets as I manage to obtain them. Disclosure: I have purchased all of these sets myself, with the single exception of the WE210 Track set (thank you to OKB Grigorov for donating that single review item). Normally I don't feel the need to make this statement, because if you don't trust me to give an unbiased review of donated items, then I don't really care what you think. However in this case, the following review is mostly glowing in its praise of these OKB resin sets, so I wanted to put to rest any suspicion that my extremely positive comments are due to any perceived bias. 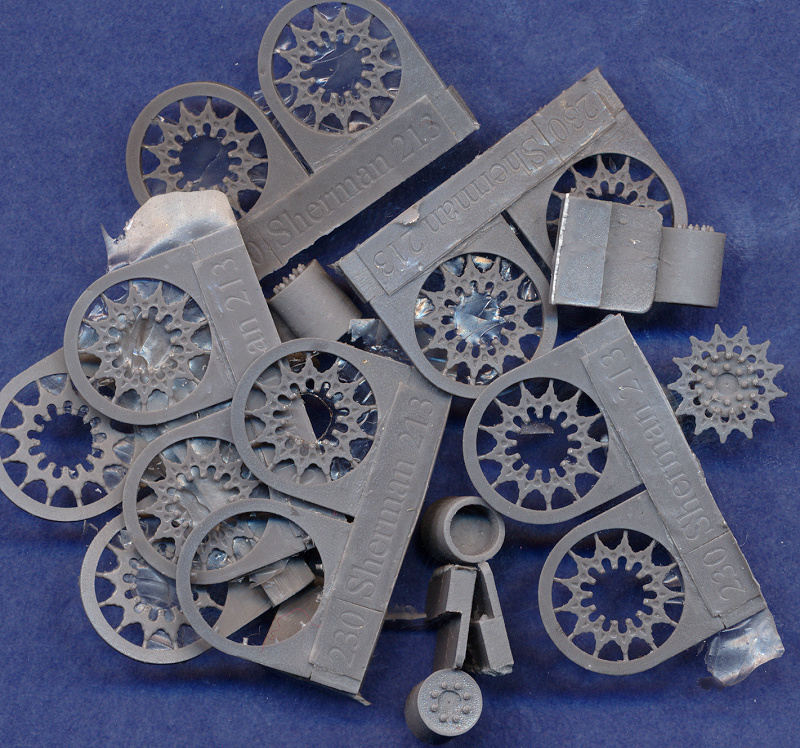 There were several styles of sprockets produced during the war, as illustrated by the scans shown below. All of these sprocket wheels scale out to perfect diameter and have absolutely gorgeous detail. 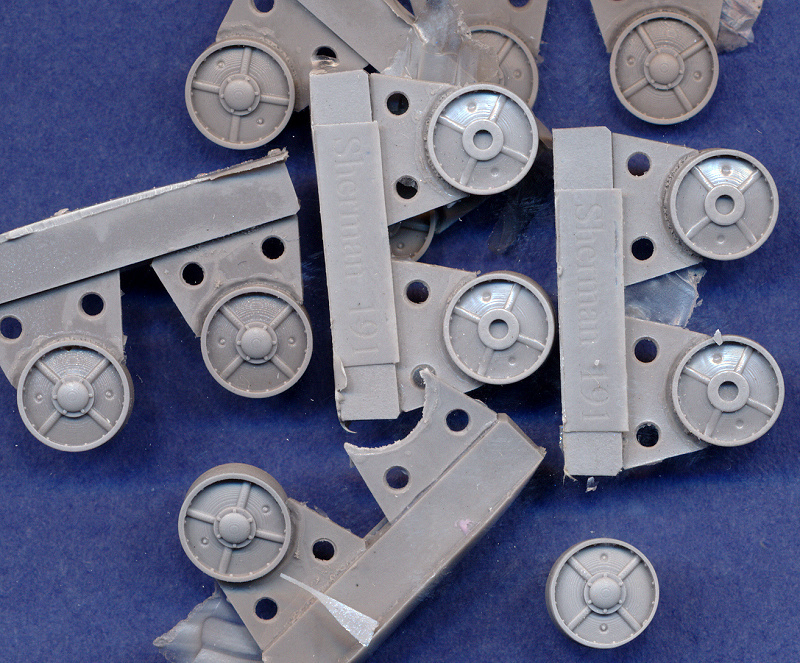 The sprocket plates are cast as individual pieces and need to be glued onto the individual wheel hubs. There are small indentations on the rear of each tang of the sprocket plates (and along the inner rim of the economy version) that allow for easy attachmet with the hub. 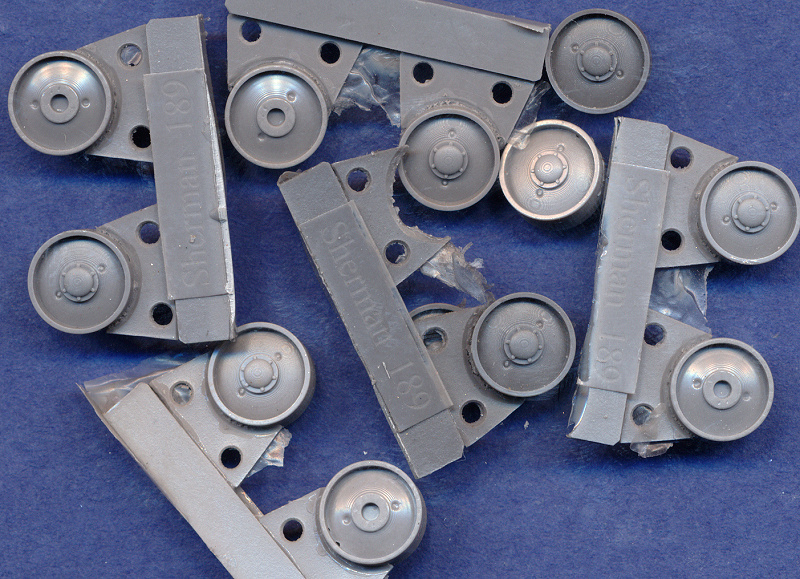 There is no mechanism, however, to ensure alignment of sprocket teeth between the front and rear sprocket plates, so care must be taken when gluing. 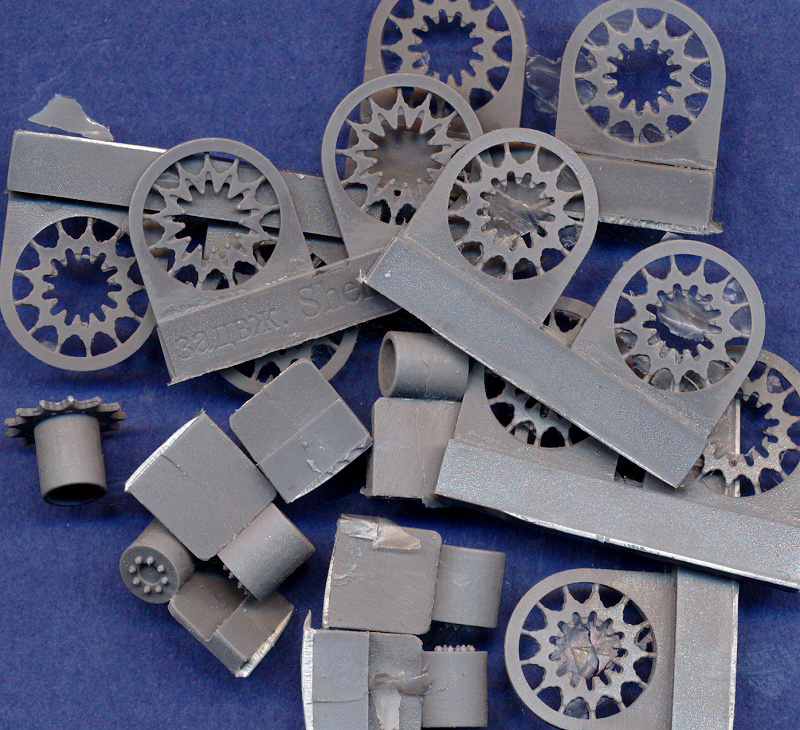 The quality of the resin casting is first-rate, with only a single sprocket wheel in all my sets showing a little mold shift. There is some paper-thin flash which is easily removed with a knife or stiff brush. Removal of the parts from the resin casting plugs was quite easy with very little cleanup needed. The wheel hubs are little long, which results in assembled wheels that are a little wider than most kit tracks that we have available to us. Refer to this article for more explanation. The rear of the hubs are not shaped to fit any particular plastic kit, and will need to be modified to be compatible with the kit to which it is being fitted. The same four sprocket design are also available for HVSS Shermans. The sprocket plates are the same, with a longer hub included for the wider HVS suspension. Sprockets for M4 family - VVSS D47366 S72211 This was the most common style of sprocket wheel during the war. The tangs where the sprocket plate is bolted to the hub showed some variation. Seen here is the most common shape, but also seen were tangs that were rounded on the points, or wider tangs with rounded corners. Set includes six complete sprocket wheels; enough for three tanks. Sprockets for M4 family - VVSS D47366, economy S72212 Another very common style, particularly later in the war. The "economy" here was not referring to saving steel, but rather production time, by not having to cut out the individual tangs where the sprocket is bolted to the hub. 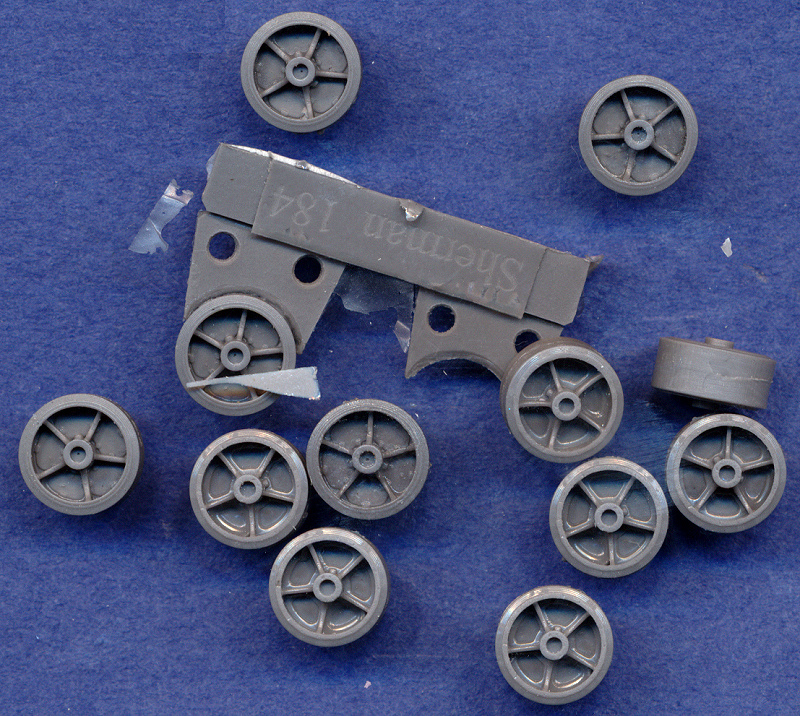 Set includes six complete sprocket wheels; enough for three tanks. 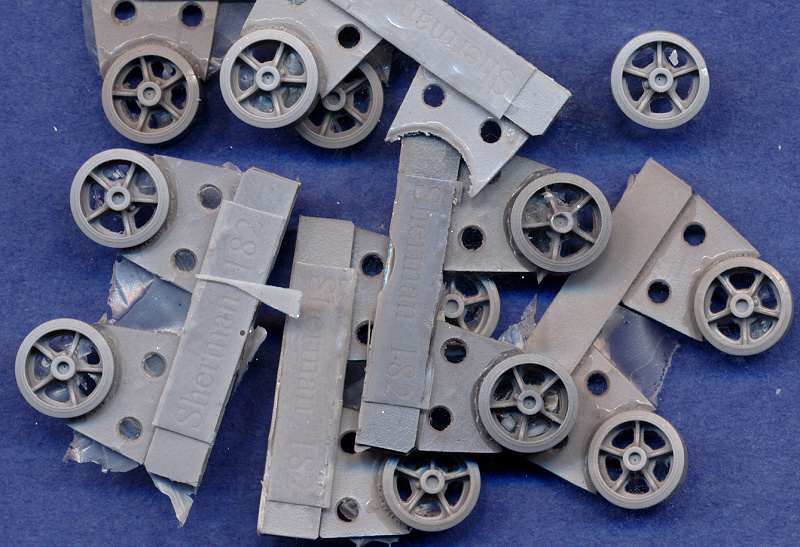 Sprockets for M4 family - VVSS D47366A, casting S72213 This cast style of sprocket was used on M4A3 Shermans built by FMC (Ford Motor Company), and was also used as field replacements on other Sherman types. 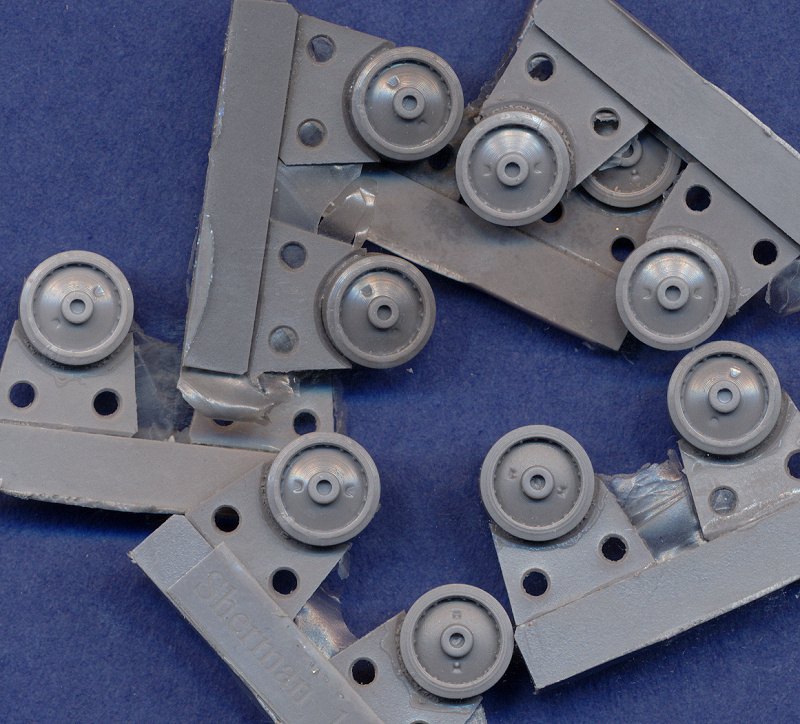 Set includes six complete sprocket wheels; enough for three tanks. Sprockets for M4 family - VVSS D47366, forging S72214 This forged style of sprocket was used on Shermans built by CDA (Chrysler Defense Arsenal), which includes late M4A3s, M4A4s, M4A6s, M4(105)s and M4 Composites. Was probably also used as field replacements on other Sherman types. Set includes six complete sprocket wheels; enough for three tanks. Sprockets for M4 family - HVSS D47366 S72228 Same sprocket plates as above, but with longer hub for HVSS. Sprockets for M4 family - HVSS D47366, economy S72229 Same sprocket plates as above, but with longer hub for HVSS. Sprockets for M4 family - HVSS D47366A, casting S72230 Same sprocket plates as above, but with longer hub for HVSS. Sprockets for M4 family - HVSS D47366, forging S72231 Same sprocket plates as above, but with longer hub for HVSS. 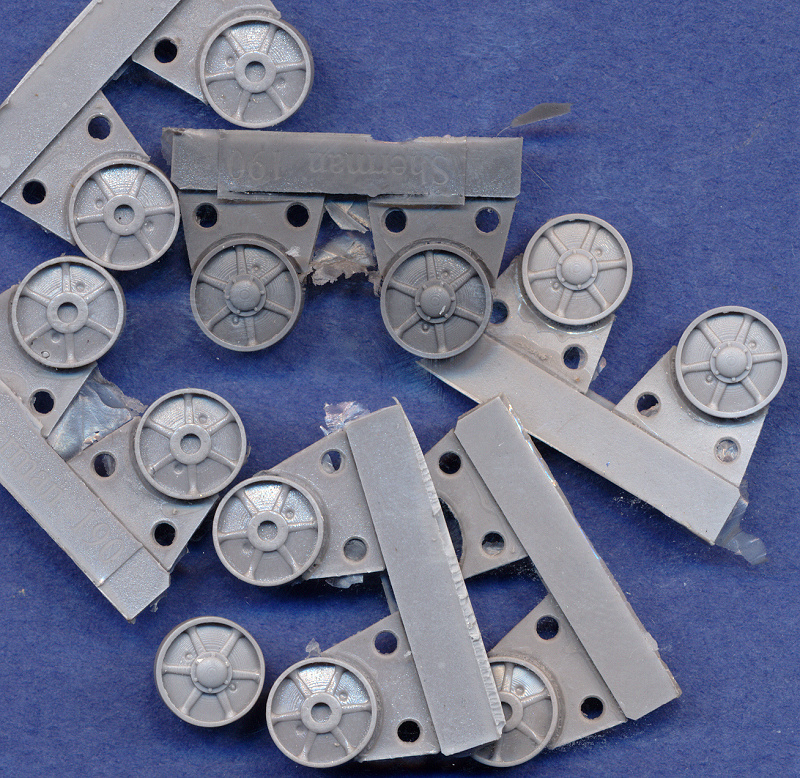 OKB gives us all four versions of the M4 idler wheel ever produced, including one that was incredibly rare. All of these designs were all-steel wheels, with no rubber tires (except perhaps the French design?) Scale is perfect on all of these and the detail is superb. Casting quality was perfect on all my sets, and the removal from the casting plugs was easy with very little necessary cleanup of the parts. 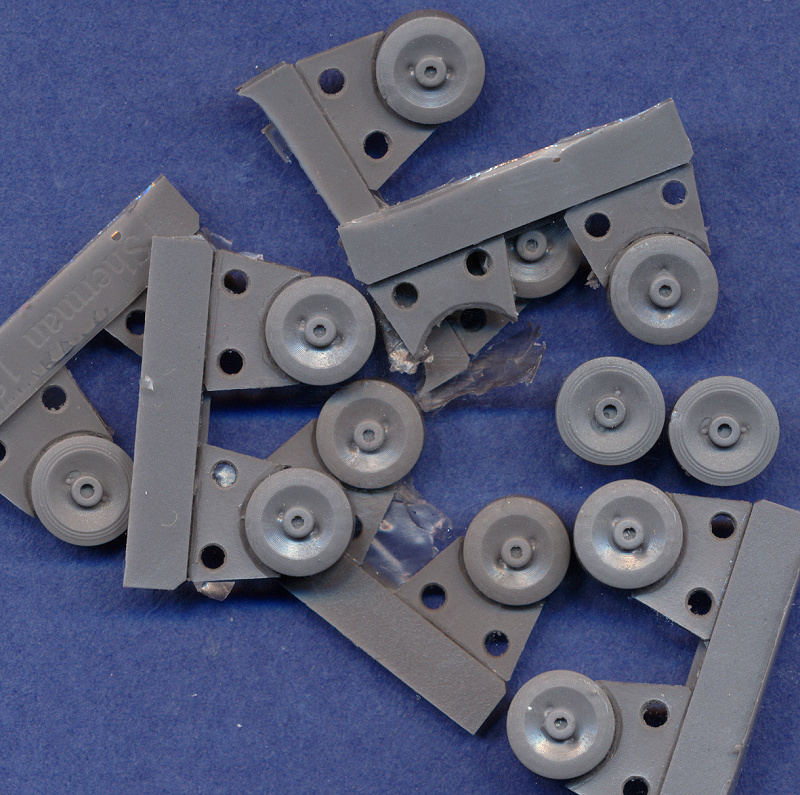 The rear of the wheels have a generic mounting hole, which can be enlarged to fit any particular plastic kit. Idler wheels for M4 family - VVSS open spoke S72188 This was the first style of idler wheel on Shermans (and M3 Mediums), and one of the most common seen throughout the war. Set includes 12 wheels; enough for six tank models. Idler wheels for M4 family - VVSS solid S72189 Very late version. I don't know if this was seen during World War II. This was the only version produced post-war. I've seen a photo of an M32 in Korea with one of these idlers. Not sure about the few VVSS Shermans that saw action in that war. Set includes 12 wheels; enough for six tank models. Idler wheels for M4 family - VVSS stamped spoke S72190 A later style, began replacing the open-spoke version mid-war. Also very common on most versions of Sherman, particularly later in the war. Set includes 12 wheels; enough for six tank models. Idler wheels for M4 family - VVSS four spoke French type S72191 A very rare, post-war design seen on some French Shermans. Notice that OKB correctly molded the bolts along the inside of the rim. I'm not sure what these are for, as the only photo I've seen of this wheel appears to show the wheels as all steel, with no rubber tire, just like the other idlers. Set includes 12 wheels; enough for six tank models. 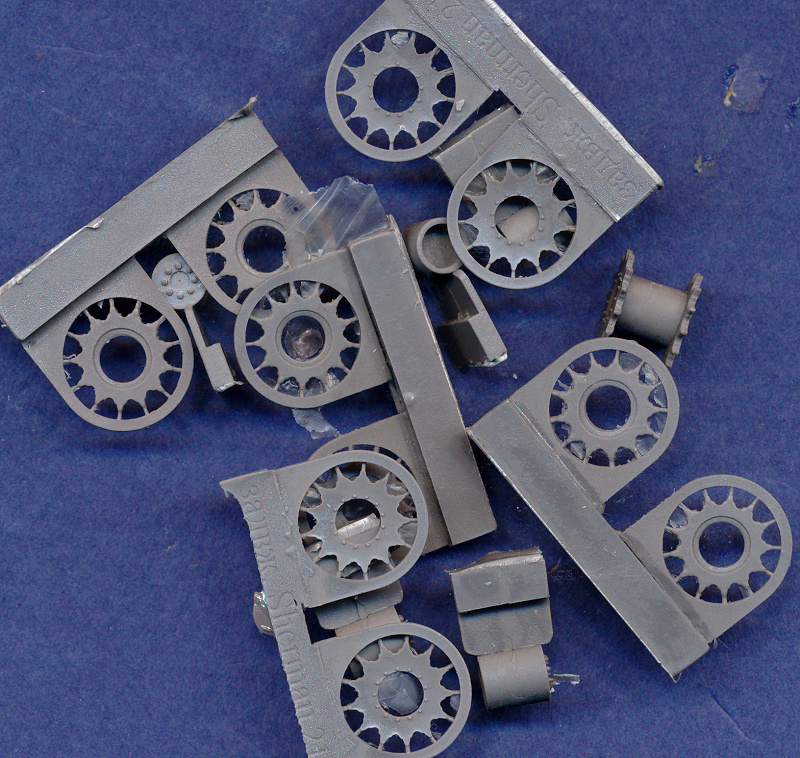 OKB has given us all the variations of road wheels for VVSS Shermans. They are molded to precise scale, and the detail is extraordinarily well done. Casting quality was perfect on all my sets, and the removal from the casting plugs was easy with very little necessary cleanup of the parts. These are without a doubt the finest resin wheels on the market. Wheels for M4 family - VVSS open spoke S72182 One of the most common styles of wheels seen on Shermans throughout the war. This was the earliest design, and was used on the M3 Medium tank as well as the M4. Set includes 12 wheels; enough for a single tank model. Wheels for M4 family - VVSS stamped spoke S72183 Another very common style of wheel during the war. Notice the rivets on the inside edge of the wheel rim, attaching the tires to the metal rim. There is a front to these wheels: the side that has the lubrication plugs. The rear face has only depressions in the face, with no plugs. Set includes 12 wheels; enough for a single tank model. Wheels for M4 family - VVSS open spoke w/TB ORD 22 applied S72184 These are essentially the open spoke wheels with metal plates welded over the openings between the spokes, designed to prevent the enemy from sliding metal rods through the spokes. Probably very difficult to distinguish in photos from the closed spoke variety shown below. Notice that on the outside faces, you can even see the weld beads where the plates were spot welded to the wheels. Set includes 12 wheels; enough for a single tank model. Wheels for M4 family - VVSS smooth concave S72185 This is the first of the three types of high capacity wheels meant for use as late-war replacement wheels for 76mm-armed Shermans and the M4A3E2 Jumbo Sherman. There is a front to these wheels: the side that has the lubrication plugs. The rear face has only depressions in the face, with no plugs. Set includes 12 wheels; enough for a single tank model. 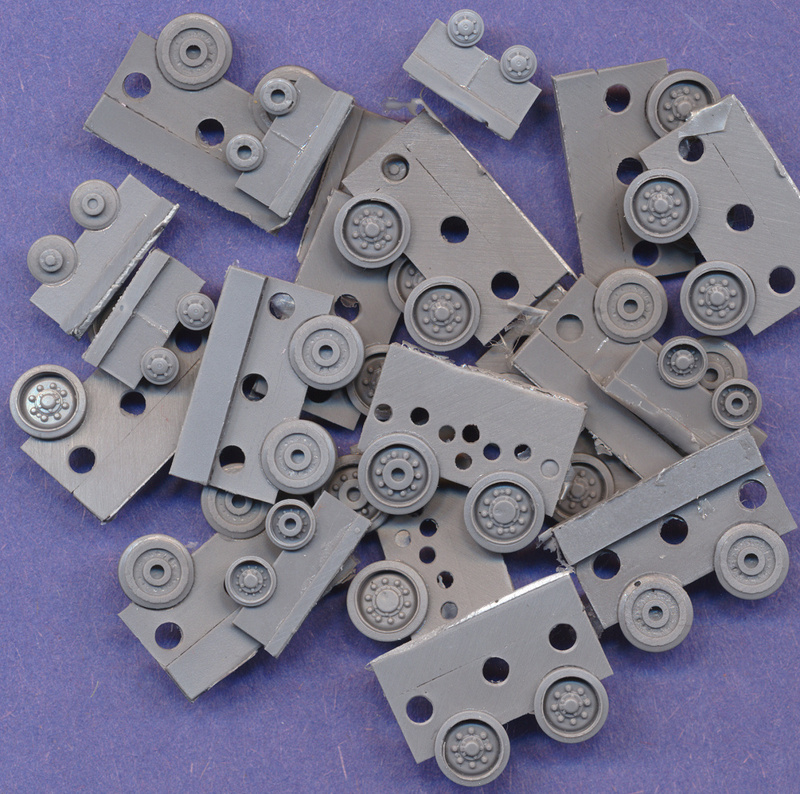 Wheels for M4 family - VVSS smooth convex S72186 This is the second of the three types of high capacity wheels meant for use as late-war replacement wheels for 76mm-armed Shermans and the M4A3E2 Jumbo Sherman. Notice the rivets on the inside edge of the wheel rim, attaching the tires to the metal rim. There is a front to these wheels: the side that has the lubrication plugs. The rear face has only depressions in the face, with no plugs. Set includes 12 wheels; enough for a single tank model. Wheels for M4 family - VVSS closed spoke S72187 This is the third of the three types of high capacity wheels meant for use as late-war replacement wheels for 76mm-armed Shermans and the M4A3E2 Jumbo Sherman. From photos, this appears to be the most common style of wheel seen on the Jumbo. Set includes 12 wheels; enough for a single tank model. Unlike the wheels shown above, the OKB track sets are slightly less than perfect. This is the one group of accessories where OKB has failed to achieve 100% scale accuracy. 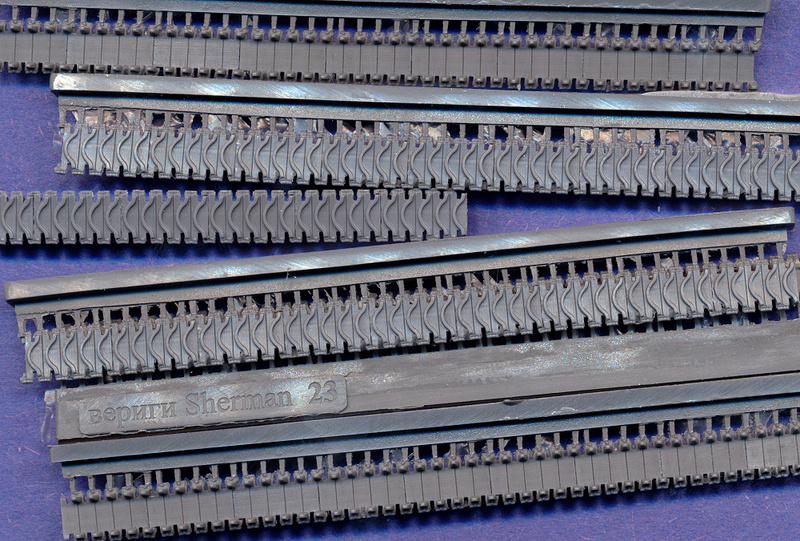 Most Sherman VVSS tracks were 16.56 inches wide, including the pins and end connectors. This scales out to 5.8mm wide in 1/72nd scale. The exceptions are the T41 (seen only on M3 Mediums and very early Shermans) and the WE210, which were 16 inches wide, or 5.6mm in 1/72nd scale. OKB's tracks vary in width (noted below) from approximately 6.0mm to 6.5mm. 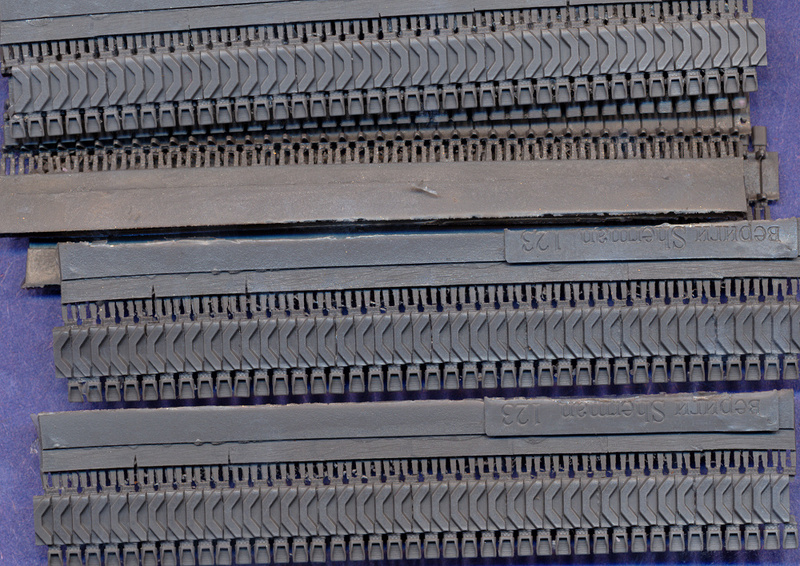 The size error lies with the width of the individual track shoes, not the end connectors, so simply sanding them down some won't correct the error. I wonder if their reference material indicated that the 16.56 inch wide track referred to only the track shoes and not the end connectors? This size discrepancy means little as such a minor scale error would be unnoticable on the final model. 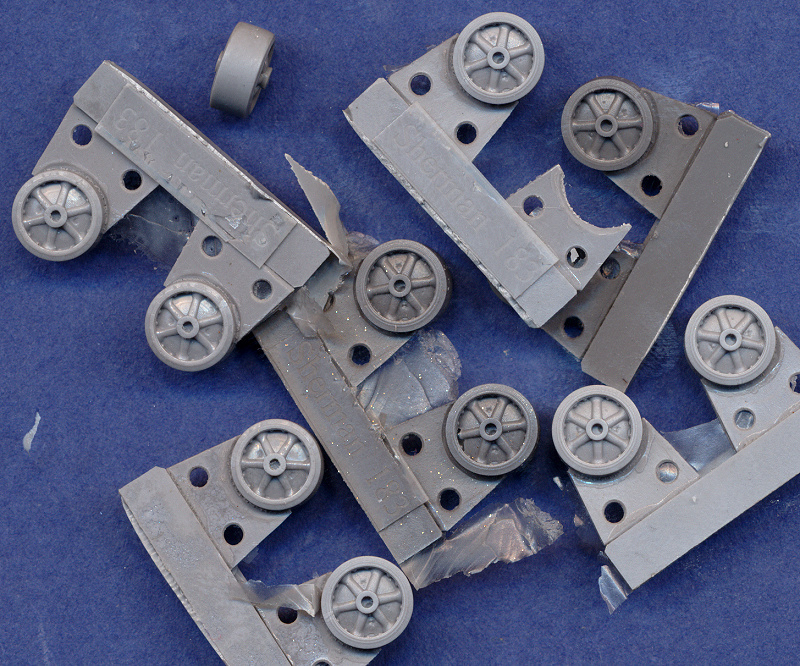 But be aware that these tracks are not a drop-fit into any existing kit, and you will have to make some modifications to the sprocket wheels in order for the tracks to fit (see this article for more details). 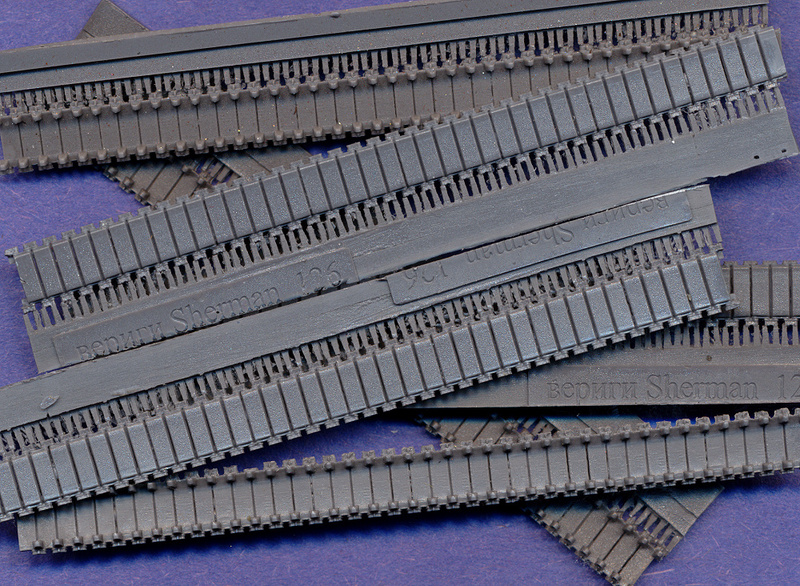 Each VVSS track set includes six lengths of track, each with 40 shoes (240 total). 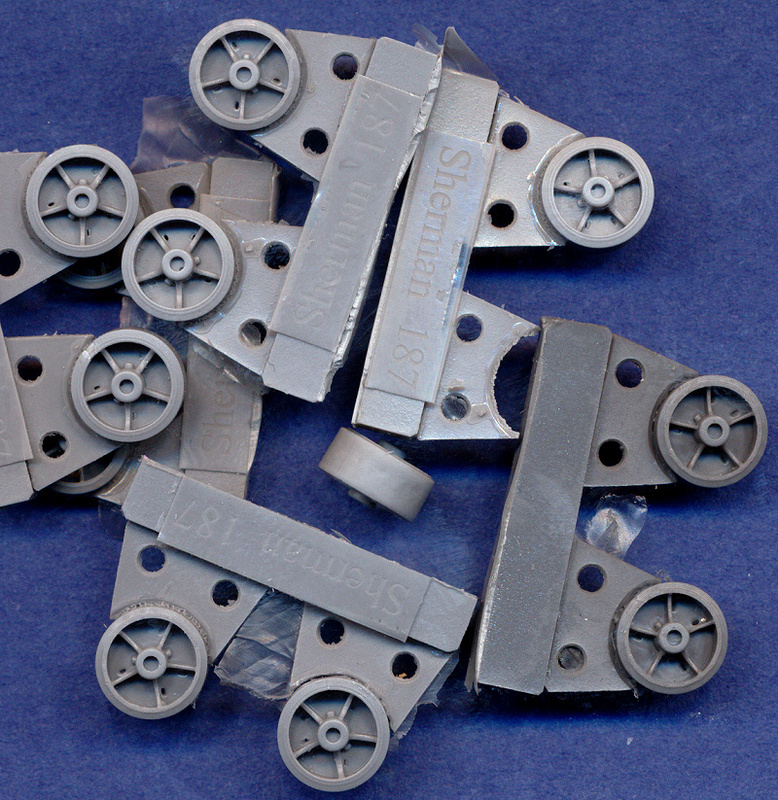 Short hull Shermans used 158 track shoes (79 each side), and the long hull Shermans used 166 track shoes (83 each side). Therefore, you'll end up with some extra track from each set for fixing construction errors (perish the thought!) or as add-on armor for the Sherman hulls and turrets. Or... you can buy three sets, and have enough tracks for four tanks. There were several styles of EECs produced during the latter year of the war, including some locally-designed patterns. Their purpose was to increase the track width, thereby reducing ground pressure and improving performance on soft ground. OKB provides three variations of the EECs, with types 1 and 2 being factory-designed patterns, and type 3 being a locally-designed pattern. 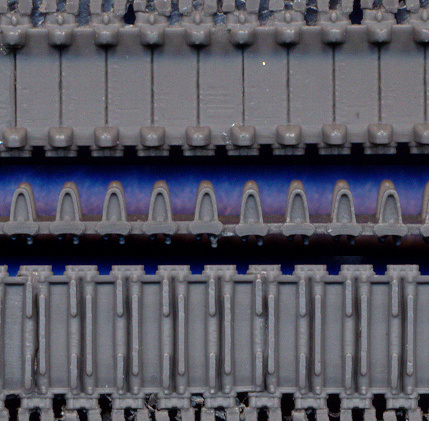 These EECs were often used on both gun tanks as well as tank destroyers (M10 and M36) and recovery vehicles. Very late in the war, there was a designed improvement of the Sherman VVS suspension, designated E9 (e.g. M4A1E9). On these tanks, the suspension units were attached further out from the hull sides, making room for EECs on both sides of the tracks. Apparently, none of these modified tanks saw action, though several were thought to have been shipped to Europe, for both US and French use. 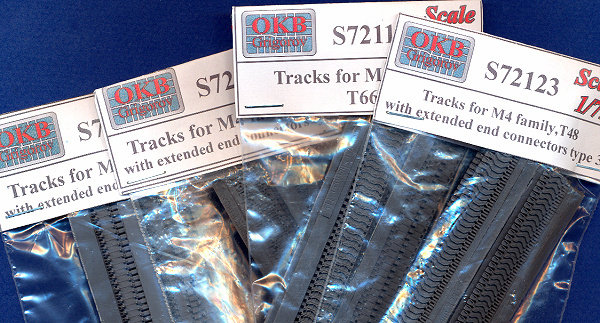 OKB gives us several track styles with EECs on both sides of the track, if you want to make an E9 conversion. Tracks for M4 Family WE210 S72023 An early style, designed for the British in North Africa, where the "double-H" shaped pattern on the track shoes better gripped the loose sand. I cannot find my set of tracks (!) so I can't measure their width at this time. I stated in an earlier review I wrote for these that they were the correct scale. By looking at the scans, they appear to be narrower than OKB's other tracks, so they are likely the only tracks in this collection that are the correct scale width. Tracks for M4 Family T54E1 S72063 A common late war design, particularly on M4A1s and M4A3s. These tracks measure approximately 6.3mm wide. Tracks for M4 Family T54E2 S72064 Commonly seen on British Shermans. These tracks measure approximately 6.0mm wide. Tracks for M4 Family T62 S72120 A rather uncommon style, seen primarily on British Shermans, particularly the Sherman V. However, considering the amount of mud and dirt that sticks to the tracks, I wonder if many photos of this track are confused for the similar T54E2 style. These tracks measure approximately 6.4mm wide. Tracks for M4 Family T48 S72122 One of the most common styles of track seen on Shermans of all nationalities during the war. These tracks measure approximately 6.4mm wide. 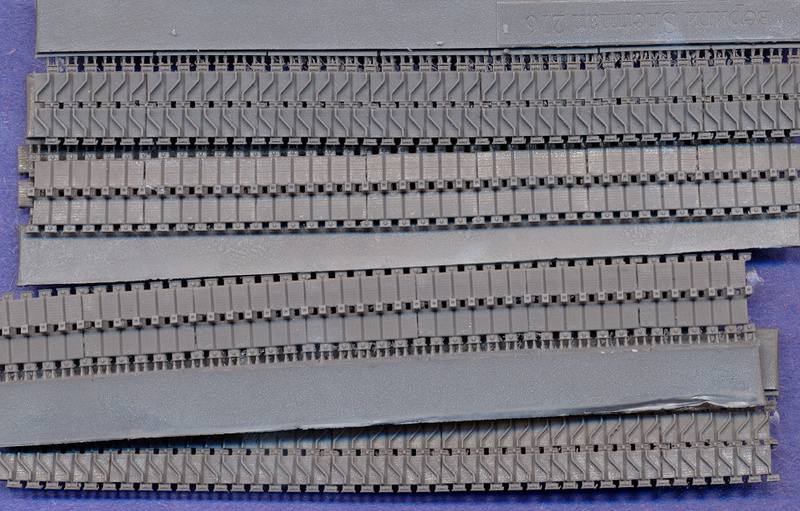 Tracks for M4 Family T48 w/extended end connectors type 3 S72123 Same comments as T48 track above. 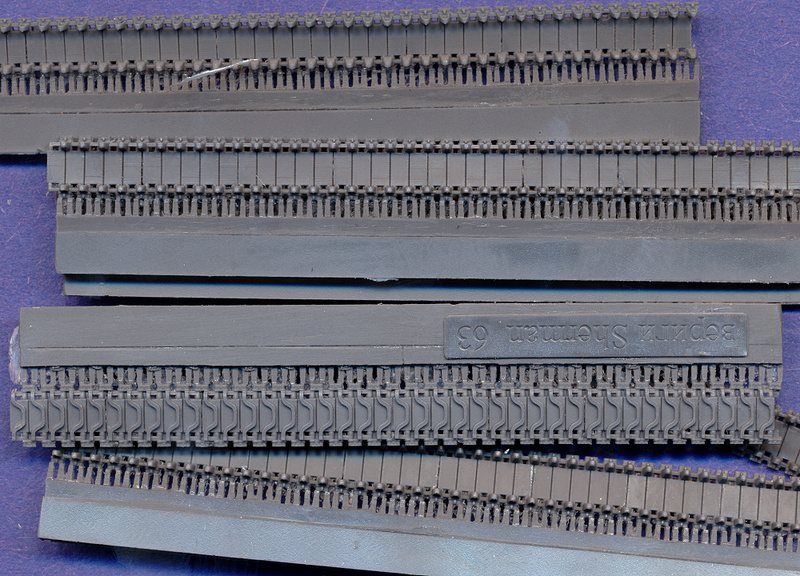 Tracks for M4 Family T49 S72124 A very common steel block design. Seen on Shermans of many nationalities, including French, Polish, British, Soviet M4A2s, as well as many US Marine and Army tanks in the Pacific. Also used on Sherman variants, such as M10s and M32s. These tracks measure approximately 6.1mm wide. Tracks for M4 Family T51 S72126 A common early war design. These tracks measure approximately 6.5mm wide. Tracks for M4 Family T56 S72130 The T56 track style is problematic; it is shown in the Army manuals for the Sherman, but according to some references, it was never cleared for production. If it was used, it is probably difficult to distinguish in photos from the T49. These tracks measure approximately 6.5mm wide. 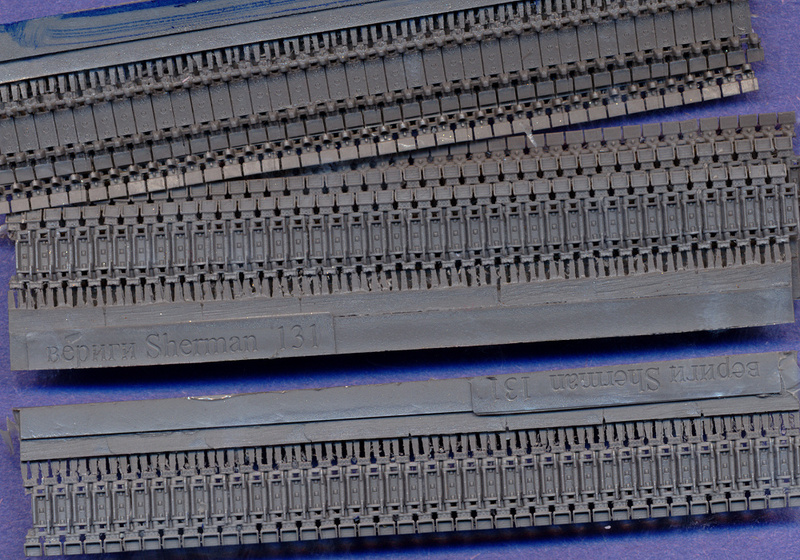 Tracks for M4 Family T56 w/extended end connectors type 1 S72131 Same comments as T56 track above. Tracks for M4 Family T74 S72132 An uncommon variant, probably easily confused in photos with the similar T54E1 style. These tracks measure approximately 6.3mm wide. Tracks for M4 Family T48 w/Two Extended End Connectors Type 1 S72169 Extended end connectors on both sides of the track for experimental E9 suspension. 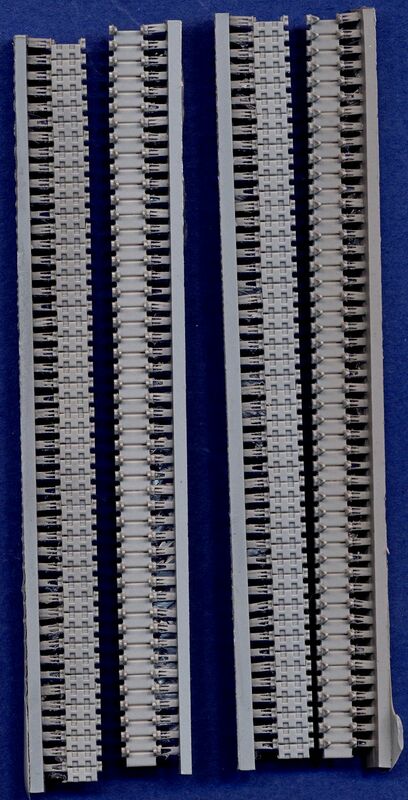 Tracks for M4 Family T74 w/extended end connectors type 3 S72171 Same comments as T74 track above. Tracks for M4 Family T54E1 w/Two Extended End Connectors Type 1 S72199 Extended end connectors on both sides of the track for experimental E9 suspension. Tracks for M4 Family T54E2 w/Two Extended End Connectors Type 1 S72200 Extended end connectors on both sides of the track for experimental E9 suspension. Tracks for M4 Family T56 w/Two Extended End Connectors Type 1 S72201 Extended end connectors on both sides of the track for experimental E9 suspension. Tracks for M4 Family C.D.P. 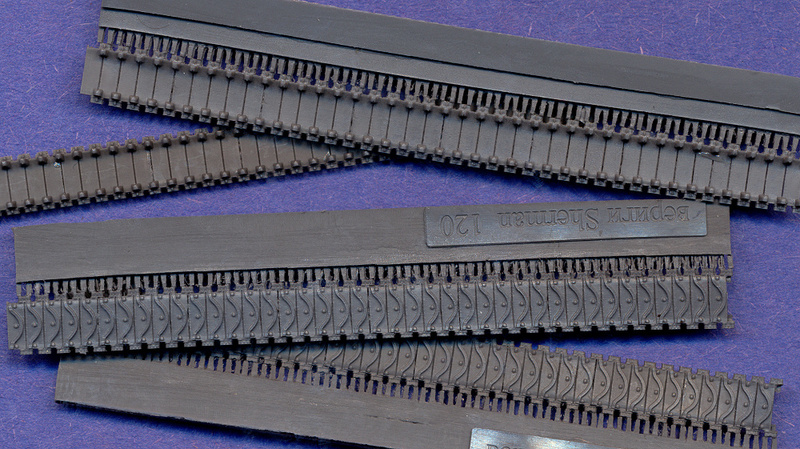 Tracks S72202 Canadian dry pin (CDP) track design for use on Grizzlies (Canadian M4A1), Sextons and Kangaroos. Set includes sprocket wheels specially designed for this track. A little narrower than US tracks, they should measure 5.3mm, whereas these resin pieces measure about 5.8mm, which is pretty good. Replacement wheels for HVS suspensions are sorely needed, as there are a number of resin conversion kits on the market that have horribly out-of-scale suspensions, or none at all. However, this set includes only wheels, no suspension parts. Looking through my past articles, I see that the suspension brackets from the old Hasegawa kit are not too far off in size, so mayhap these wheels could be used with those suspension parts. Regardless, they are gorgeous wheels, and could be used to replace the wheels from the other plastic kits (UM, Trumpter, Dragon). Although those wheels don't really need replacing from the perspective of detail, these new wheels will certainly come in handy for replacing the kit wheels that are molded as integral parts with their suspension brackets. All four of the wheel types included in this set scale perfectly to 1/72nd. The quality of detail and casting is unsurpassed. The only blemish I noted was on the hub of the idler wheels, but that is easily remedied. Wheels for M4 Family HVSS S72245 Includes roadwheels, idler wheels, and both sizes of track return rollers. Enough wheels are included for a single tank. 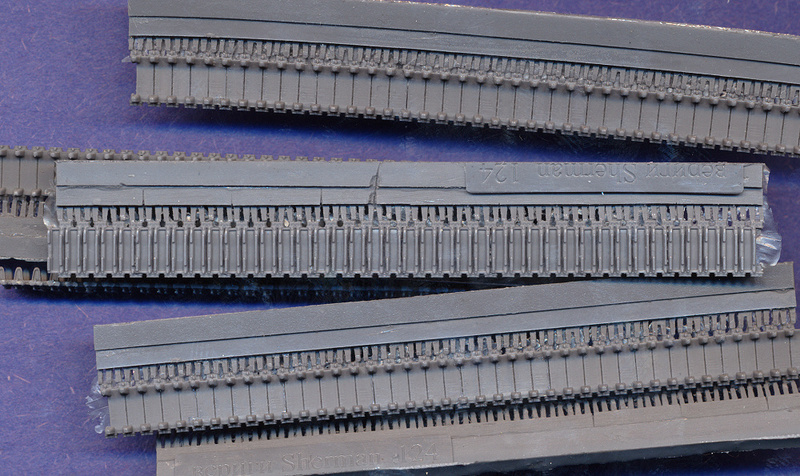 Unfortunately, the scale problems are more extreme for the HVSS tracks that OKB sells. 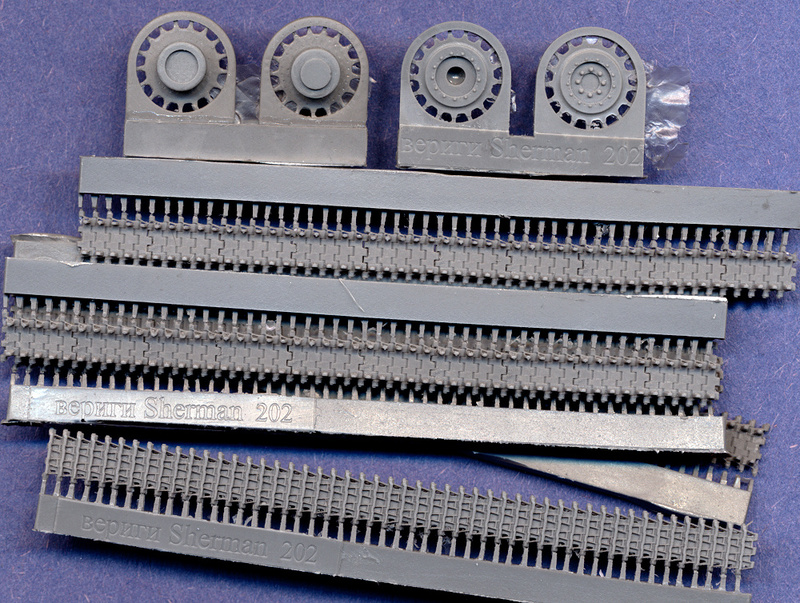 HVSS tracks were 23 inches wide, or 8.1mm in 1/72nd scale. 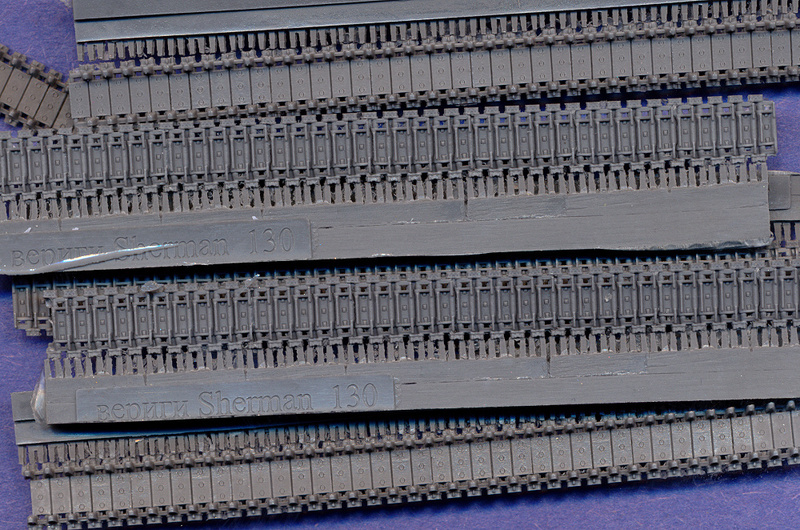 The T80 tracks are 8.7mm wide (not too bad), but the T66 tracks are 9.5mm wide; an error that may be noticable on a built model. Leaving aside the track size, these tracks are again beautiful. 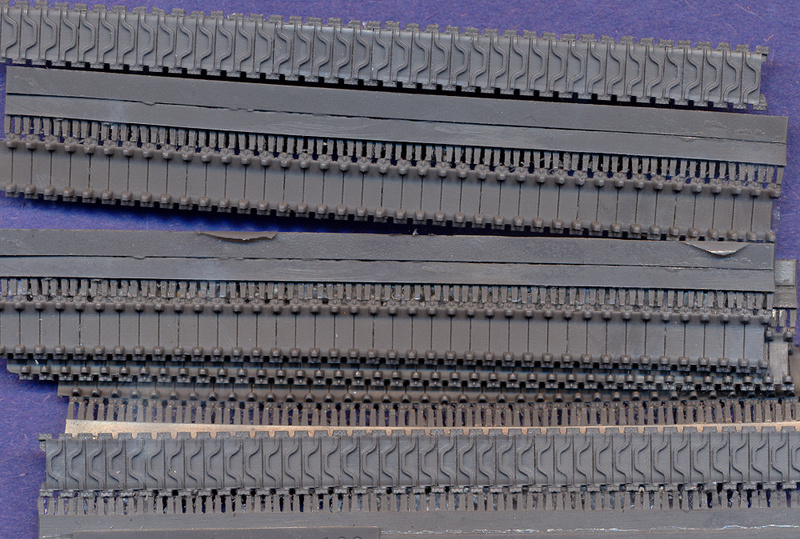 The detail and molding are lightyears better than any other HVSS track that we have available to us. The center guide horns are correctly open to the front and rear, not the sides. Removal from the casting blocks is easy, as long as you are patient and use a very sharp blade. Some pieces had some paper-thin flash between the end connectors, which was easy to clean off with the tip of a knife. Each track set includes six lengths of track. The T66 has 36 links per length of track, for a total of 216 links. 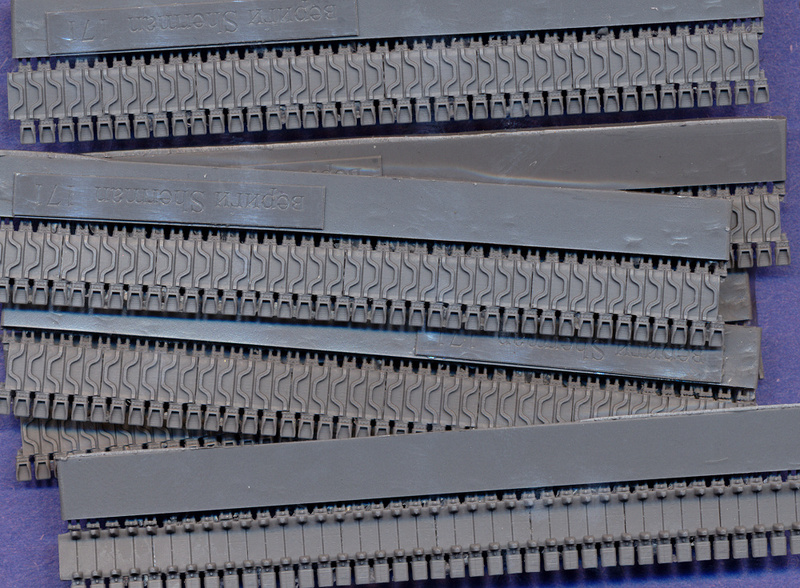 The T80 has 42 links per length, for a total of 252 links. 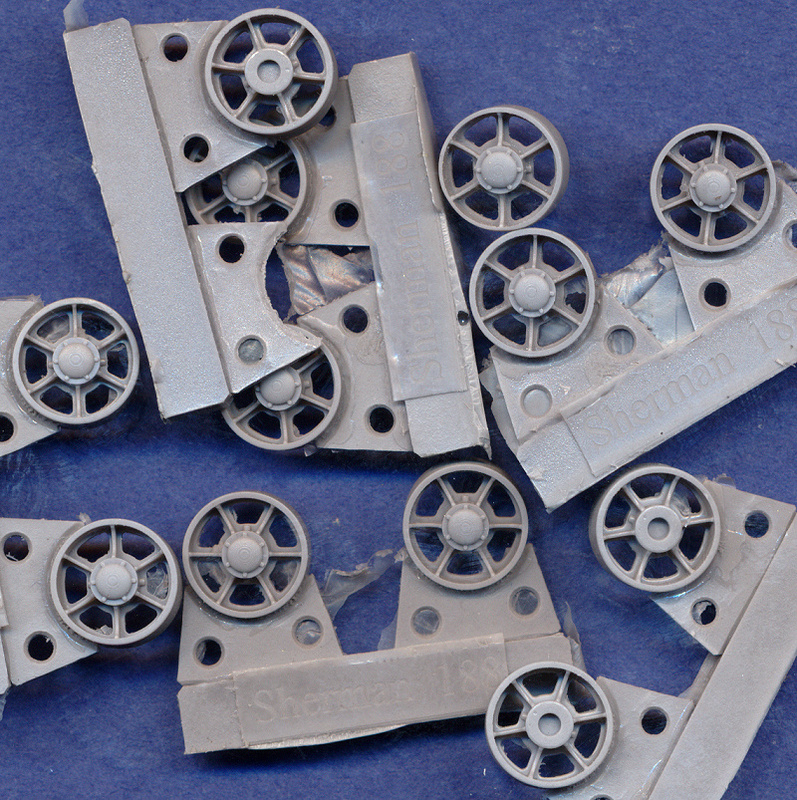 Just as with the VVSS, HVSS Shermans used 158 track shoes (79 each side), so you'll have plenty of extra in each set. 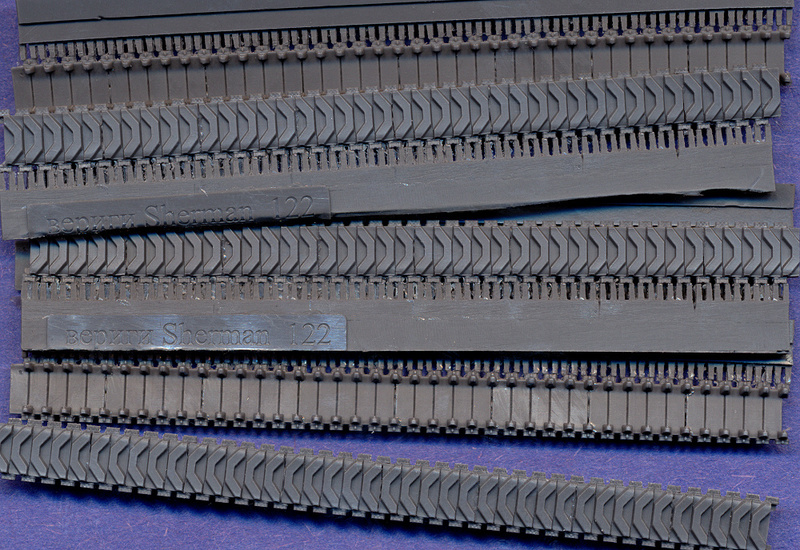 The pitch of each track shoe should be the same as for the VVSS tracks: 6 inches (2.1mm in 1/72nd). 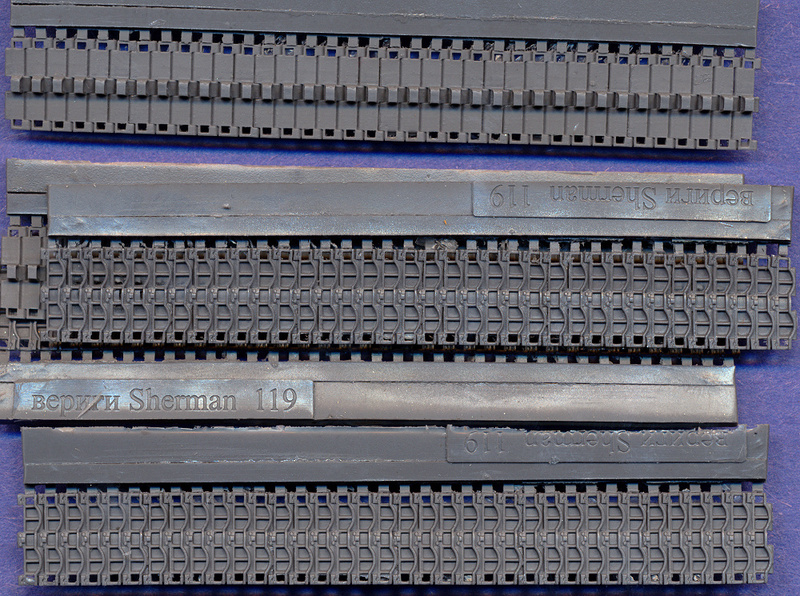 The T80 track shoes have a pitch of about 2.0mm and the T66 track shoes' pitch is about 2.2mm, hence the difference in number of links per length of track. Obviously, the T66 style will therefore require fewer track links for a single tank, than the T80. 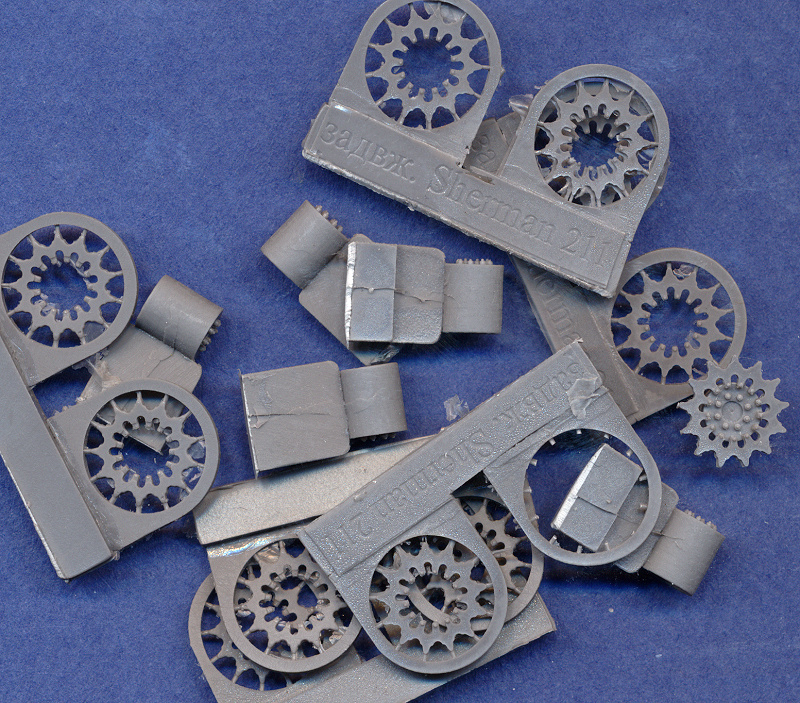 I have not yet tried to fit these tracks to any kit suspension or sprocket wheels, or to OKB's own sprockets, so I don't know how these scale errors may or may not be problematic when using these tracks. S72215 Most common style in WWW II. Measures approximately 9.5mm wide. Tracks for M4 Family T80 S72216 Late design, and only occasionally seen towards the end of the war. Most Korean War Sherman mounted this style. Measures approximately 8.7mm wide. Tracks for M4 Family T84 S72217 Post-war design. Curiously though, I've seen only a couple photos of Korean War Shermans with this track style. They mostly used the T-80 tracks.